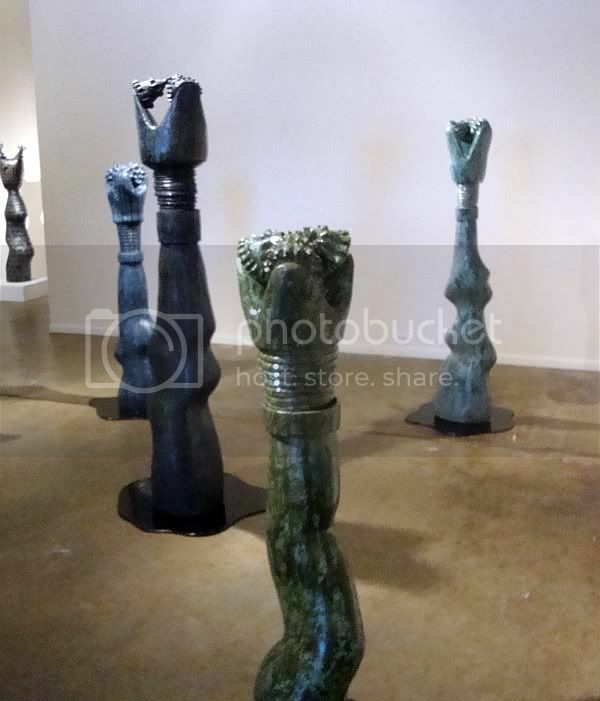 I was surprised when I walked into New Gallery to see these objects. 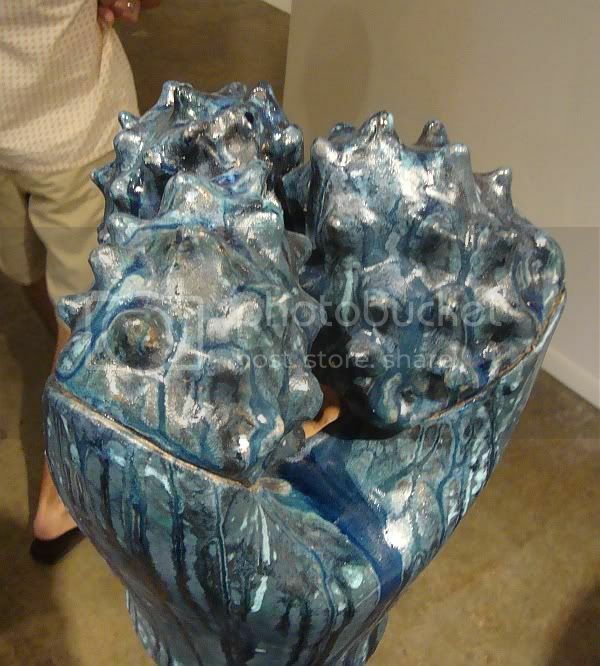 This sculpture group by Susan Budge, collectively called Out of the Depths, takes drill bits as its subject. Specifically, the drill bits are tri-cone rotary drill bits--the type that are used to drill for oil. The three cones crush up the rock while drilling mud is conveyed down the center of the drill pipe, exiting through a hole in the middle of the bit, where it carries the crashed up rock (known as cuttings) back to the surface on the outside of the drill pipe. (This is information that rarely comes up in art criticism, but it seems appropriate here.) Invented in 1934 by engineers at Hughes Tool Company, they are still in use today all over the world. For Houston, this is a very important piece of technology. I've often wondered why more artists here don't take this kind of thing as a subject or starting point for their work. Budge's interest is familial--her grandfather was a roughneck--an oil field worker--and her father was a petroleum geologist. 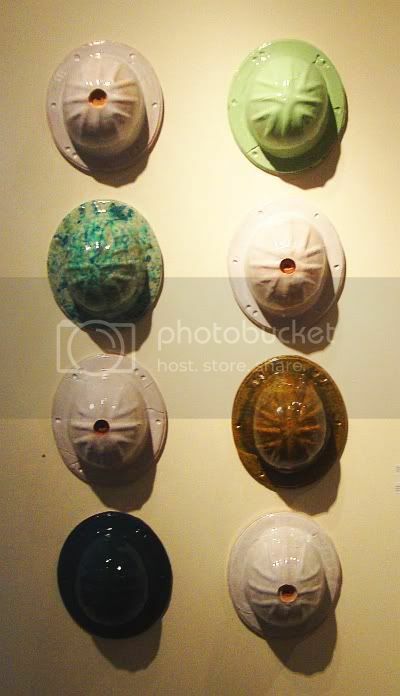 On a similar theme are her ceramic representations of hard-hats. Hard hats are a loaded symbol. In the late 60s and 70s, "hard hat" was a metonym for the conservative working-class men who harbored a resentment towards hippies, African Americans, and other groups who were changing America in uncomfortable ways. (The hard-hats aged and became today's Tea Party.) But I think Budge's conception of hard hat wearers is far more positive, referencing earlier conceptions of working class men as the noble proletariat, the doers. Even though hard hats are worn by a variety of workers in a variety of circumstances, I associate these hard hats with oil and gas workers because of their proximity to the Out of the Depths sculptures and because of Budge's own family history. I also associate it with oil and gas production because I'm in that business myself; I see hard hats (and wear one) whenever I am on a worksite. 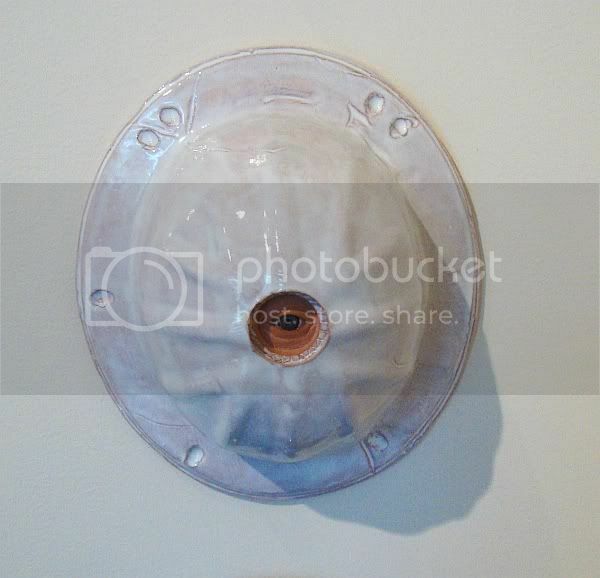 I work in an office playing with spreadsheets, just like most of my co-workers, and yet every single one of us has at least one hard hat hanging on the wall. Budge divides the hard hats into two series, Tribute and Sacrifice. Tribute seems straightforward--tributes to the roughnecks and roustabouts out in the oil patch. The Sacrifice hard hats, created in 2010-2011 are quite eerie. They each have a eye staring out from the top of the hard hat. The eye is realistically depicted and slightly uncanny because of it. While the Tribute hard hats are in a variety of fanciful colors. the Sacrifice hardhats are all white. It occurs to me that the Sacrifice hard hats may have been made in response to Deepwater Horizon disaster on April 20, 2010. Eleven workers were killed when the Deepwater Horizon exploded--all wearing hard hats, most likely. Of all the work in the show, I found the Tributes and Sacrifices to be the most moving. 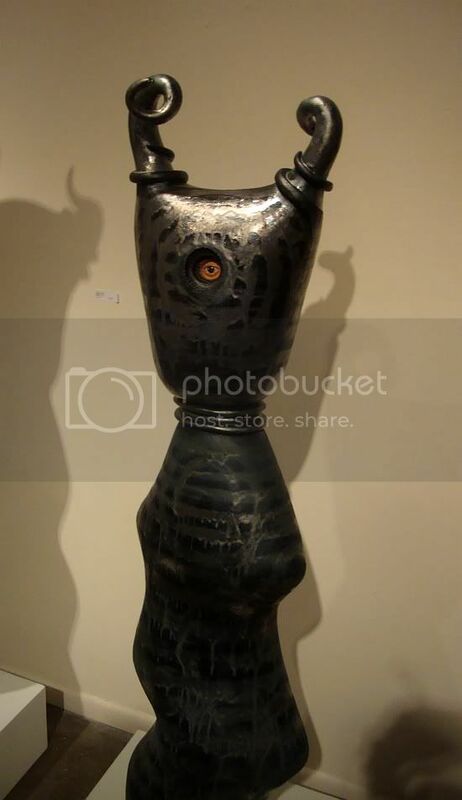 Some of the other pieces in the show are identified as "Shalakos" and "Koshares." Shalako, according to Wikipedia, is "a series of dances and ceremonies conducted by the Zuni people at the winter solstice, typically following the harvest." Wikipedia goes on to note that because Shalako is at least partly open to non-Zunis (unlike other ceremonies), it has achieved a certain popularity with the "New Age" crowd. 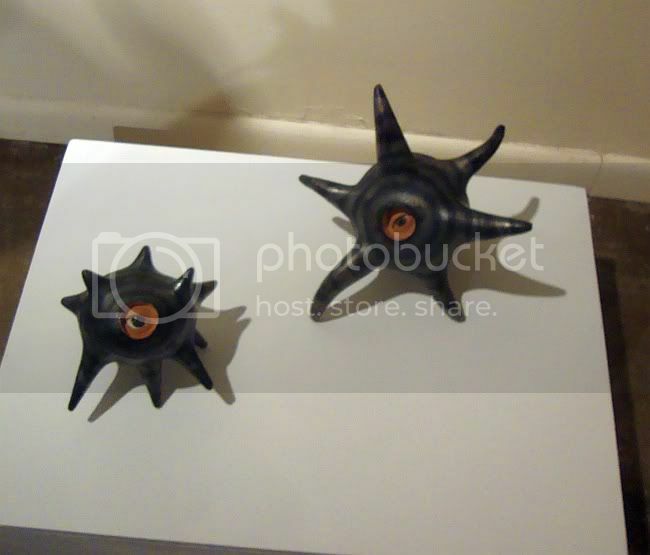 And these mysterious totemic objects have something of a New Age feel to them. "Koshare" refers to a type of Hopi Kachina, specifically a representation of a clown or trickster figure. Budge makes reference to her spiritual beliefs in her statement, and my conclusion is that these beliefs are of the New Age variety. While their eyes give them a bizarre quality, these statues feel fundamentally decorative. They don't strike one with the power of quasi-shamanic performances by Marina Abramowicz and Ulay or Joseph Beuys; or various disorienting surrealist masterpieces like Europe After the Rain by Max Ernst or the She Wolf by Jackson Pollock. These are probably unfair comparisons to make, but worth making if only because Budge's art seems to make big claims for itself. It wants to be spiritually serious. The thing is, one can see putting one of these handsome, well-crafted sculptures in one's garden or in a corner of the house, but one can't see leaving an offering to it. The possible exception to this are the deeply unsettling Sacrifice sculptures. The CEO of Transocean should hang one of these in his office and spend a few minutes every day with it, remembering by name the 11 who died on the Deepwater Horizon. That would be an appropriate offering.